The Smooth Fox Terrier is a balanced, well-proportioned terrier with a distinctive head that has a tapering muzzle, fiery dark eyes, and folded v-shaped ears set well up on the head, but not prick. It is a sturdy dog in that it is well-muscled and exhibits endurance, but should not appear in any way coarse or cloddy. The male Fox terrier is tame but it will also respond to your commands. Shoulder height of a male Smooth Fox Terrier should be no taller than 17.5 inches with females proportionally less, and a male in show condition should weigh approximately 18 lbs. The tail should be set well up on the back and be straight or slightly curved, but not carried over the back or curled. Its coat is hard, flat, and abundant. This breed does shed somewhat. In color they should be predominantly white—some are even all white—but typically with markings of black and tan, black, or tan. Red, liver, or brindle are objectionable and disqualifying faults in the show ring. Heads are usually solid colored, but a variety of white markings are permissible, including half or split faces, blazes, or color only over the eyes and/or ears. 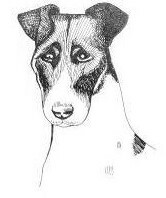 The Smooth Fox Terrier's development as a breed is largely undocumented, but the dog has been known as a distinct breed in England since at least the 18th century; the first documented evidence of the Smooth Fox Terrier came in 1790, when a man by the name of Colonel Thornton painted a portrait of his beloved dog, Pitch. Conventional wisdom has long held that the Smooth Fox Terrier and Wire Fox Terrier are variations of the same breed; in recent years, however, an increasing number of experts have stated the opinion that the two breeds are not related at all. Whereas the Wire Fox Terrier is probably directly descended from the Rough Black and Tan Terrier of Wales, the Smooth Fox Terrier is thought to count the Smooth Black and Tan as its primary ancestor, with traces of Beagle and Bull Terrier thrown in as well. However, the two breeds were considered to be varieties of one breed and were occasionally interbred until the mid 1980's when AKC changed them from varieties to separate breeds. All modern Smooth Fox Terriers trace back to wires many times, from Eng. Ch Watteau Chorister, through Eng. Ch. Lethal Weapon, Eng. Ch. Corrector of Notts and Eng. Ch. Cromwell Ochre's Legacy back to Dusky D'Orsay. Bred by Mr. Francis Redmond, Dusky D'Orsay's sire was a Wire, Dusky Collar, and her dam a Smooth, Eng. Ch. D'Orsay's Donna. Through Dusky D'Orsay, all modern Smooths trace back to several famous Wires, including Ch. Cackler Of Notts and Meersbrook Bristles. The Smooth Fox Terrier's historic profession is fox bolting. A fox bolting dog will accompany pack of foxhounds and "bolt" after foxes, driving them out from their hiding spots and into the line of sight of the larger dogs and men on horses. Smooth Fox Terriers with white coats were less likely to be mistaken for the fox in close combat situations, and were therefore more highly prized. The Smooth Fox Terrier entered the show ring during the mid-1800s, making it one of the earliest entrants in such events. The American Kennel Club recognized the Fox Terrier in 1885; one hundred years later, the Smooth Fox Terrier was recognized as being a distinct breed from the Wire Fox Terrier. Smooth Fox Terriers make excellent family pets. Because this is an intelligent and active breed, they must be kept exercised, and interested, and a part of the family. They are affectionate and playful. They have well-developed hunting instincts. Left to their own devices and deprived of human companionship, undesirable behaviour may be exhibited, including chasing of small animals, constant barking, becoming bored, destructive, or escape artists if ignored.